The General Data Protection Regulation (GDPR) is a legal framework for personal data protection across the European Economic Area (EEA) that went into effect on May 25, 2018. The regulation replaces the existing data protection framework under the EU Data Protection Directive. Smaato continues to implement and update our processes and policies as required to comply with the GDPR. We are also committed to supporting our partners in their own GDPR compliance initiatives. Please refer to the resources below for more information on how to achieve GDPR compliance. 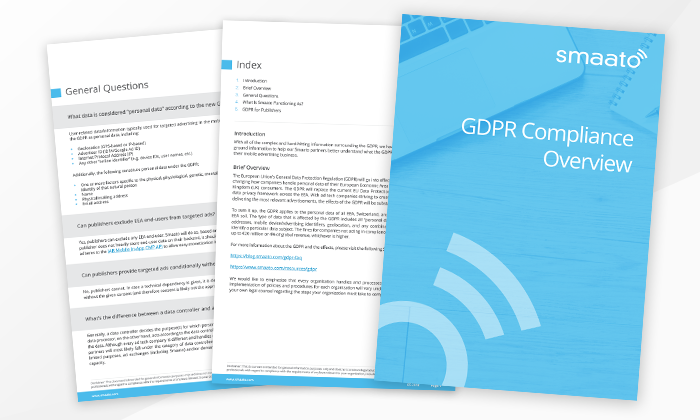 Download our GDPR Compliance Overview to gain insight into the factors required for organizations to ensure GDPR compliance. If you have any questions, please download our GDPR Q&A documents below, reach out to your account manager, or contact us here. GDPR-compliant publishers gain an advantage over other apps and can bring in new business. 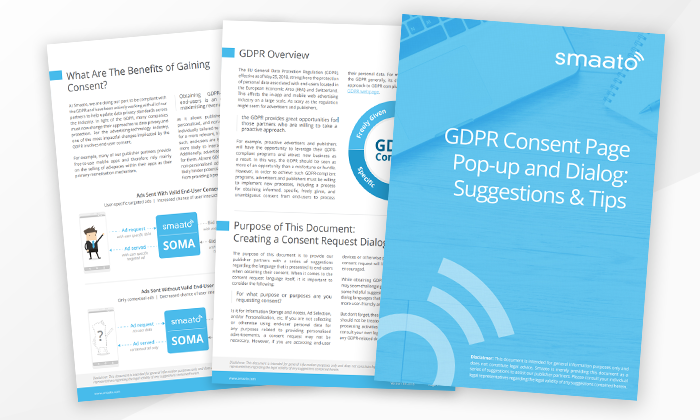 Download this guide to develop a process for obtaining informed and unambiguous consent from end-users to process their personal data. The European Union’s General Data Protection Regulation (GDPR) went into effect on May 25, 2018, significantly changing how companies handle personal data of their EU consumers. To keep up with the fast pace at which technology is developing, the EU has begun amending its regulations to reflect these technological advances. Until now, the role of a data protection officer (DPO) had been largely undefined. Historically, data was considered primarily in the context of computing, and those given the role of a DPO were frequently professionals with an information. Disclaimer: The information on this webpage is for general information only and does not constitute legal advice. Please consult your own legal professionals if you seek advice on specific interpretations and requirements of the GDPR. I agree to receive marketing, product, and other promotional updates from Smaato. © 2005-2019 Smaato, Inc. All Rights Reserved. Smaato® is a registered trademark of Smaato, Inc. SOMA™ is a trademark of Smaato, Inc.